It's that time of year again when panto is everywhere. It's unavoidable. Halloween is over and the run up to Christmas has officially begun. Theatres are being filled with pantos of all shapes and sizes and although I'm a fan, this year I was thinking about starting a new Christmas tradition and seeing what else is on offer this Christmas season. Last year the Royal Opera House welcomed guests for the 'Peter Hamlyn Christmas Treat' performance of The Nutcracker. With tickets costing a fraction of the price, the performance allowed an entirely new audience to witness the magic. Sadly I didn't make it there last year but with this in mind, I wondered where I could see it this Christmas season. Think of ballet, think of Christmas and you can't help but think of The Nutcracker. It's the all time classic winter ballet performed by numerous companies every Christmas season. I'm sure most of you already know the story but, just in case and in the briefest way possible, The Nutcracker follows Clara's Christmas eve adventure across Edwardian London with her nutcracker soldier in escape of the Mouse King. Filled with all the classic images of Christmas, alongside the Sugar Plum fairy and a dashing prince, The Nutcracker could (probably) even make your 'Grinch-iest' friends feel the magic of Christmas. And since The Nutcracker is ballet's answer to theatre Christmas panto, it is pretty much guaranteed to be performed every year. And this year is no different. We're spoilt for choice. 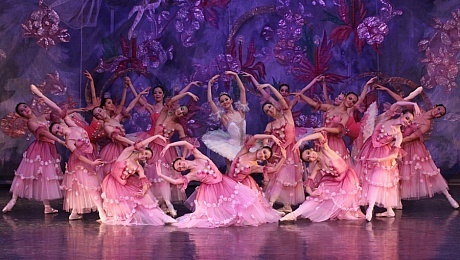 The show is being performed by the Vienna Festival Ballet and Moscow City Ballet, to name just a few. But maybe ballet's not for you, or maybe you missed your chance and the show's now sold out. Another festive show worth considering for a new Christmas tradition is Slava's Snowshow. Slava is a clown, as are the rest of the ensemble. Before you run for the door screaming about your fear of clowns, take a moment and hear me out. 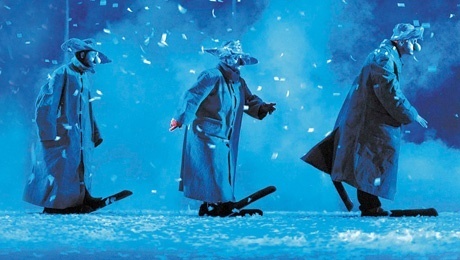 Slava's Snowshow toured the UK for the second time last year to rave reviews; enchanting the audience with the wonder of Christmas, snow and laughter. The show is interactive and features an ensemble cast of clowns using cobwebs, bubbles and dry ice to create this stunning spectacle. And *spoiler* the show's grand finale envelops the audience in a blizzard, leaving the entire theatre knee deep in snow. Having seen a few photos taken by spectators, there are big bouncy balloons too. What more could you want from your new Christmas theatre tradition? This is bound to leave you with a massive smile on your face and remind you of the days when you spent the year counting down the days till you could write your letter to Santa and his elves. It's a great show for all ages and definitely a new experience to say the least. And I know I began by saying this year could be all about new traditions but with the comedy trio Sleeping Trees, Cinderella and the Beanstalk at Theatre 503 has definitely made me a little curious. A spin on the traditional Christmas pantomime, Cinderella and the Beanstalk is, simply put, pantomime's equivalent to The Reduced Shakespeare Company's The Complete Work of Shakespeare (Abridged). Three men act all the parts in a show that weaves storylines and characters from all our favourite pantos in 90 minutes of song, dance with I'm sure at least a few mishaps. If you feel like doing something different this year visit the ATG Christmas Shop to find all you need to know about whats on in and around London this Xmas. Whether this year is the start of a new Christmas tradition or you stick with your annual trip to the pantomime, make sure you bring (or drag) a few friends and family along the way. After all, its all in the spirit of christmas!